If you run to the grocery store every other day buying an item here and an item there for dinner each night, you are not using your shopping time efficiently. 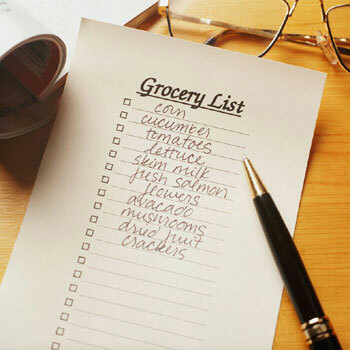 Just think of the extra time and gas savings you will have if you sit down once a week and plan your meals. This is what I do each Sunday. Check the refrigerator for fresh ingredients that need to be used. These are the first items I think about putting into a meal. For instance, I have broccoli and a lot of eggs from last week. Do I have some cheese, check. Then I need to buy a pie crust and make quiche this week. Broccoli cheddar quiche is always a hit with my family. If I have enough ingredients I will make two and freeze one, which will take care of another meal in a week or two from now. Check the freezer: Frozen items last a fairly long time, but the freezer should be your next place to check after the most perishable refrigerator items have been added to the menu plan. So what do I have in the freezer: some chicken breasts, that can work nicely with a pre-made curry sauce I have on hand, along with some leftover mashed potatoes. I have frozen green beans too. Complete meal: got a protein, carbohydrate, and a vegetable. Almost over looked some ravioli, with some jarred sauce and a salad that will make a quick meal on a day that is busy. Check your pantry: Looks like I have a lot of difference rice and I have cans of beans. I think I might make some Mexican rice (just use a pre-mixed seasoning) and I’ll spice up the beans with some leftover salsa. I will buy some guacamole, and I have some sour cream in the fridge. Sounds like a nice meatless Spanish dish. Check your collection of recipes. I’ve wanted to make a Thai pork and noodle soup recipe I had cut out of Real Simple magazine. I added the ingredients I need for this dish to my shopping list. Check for variety: I make sure that I have mixed up grains and proteins, don't want to have potatoes every night. I also checked that I’m not serving chicken two nights in a row and pasta three times in a week. Foodie Friday: Mashed Potatoes: Simply the Best!